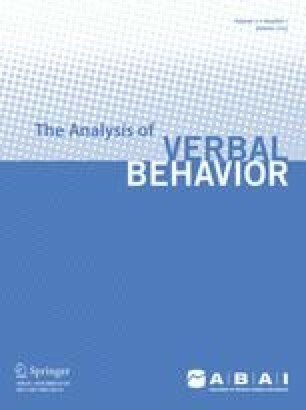 In the behavioral literature, self-echoic behavior has been hypothesized to play an important role in, for example, emergent conditional discriminations (e.g., Lowenkron, 1991), emergent verbal operants(Horne & Lowe, 1996), and problem solving (Skinner, 1957). Although early behavioral intervention programs for children with autism emphasize the establishment of accurate echoic repertoires, the type of stimulus control that defines a self-echoic response is typically not addressed. We report the development of a self-echoic assessment procedure that was administered to children with and without autism spectrum disorders. Preliminary results indicated that a discrepancy between echoic and selfechoic repertoires was more likely to be present among participants with autism than among typically developing participants. Future research should evaluate the extent to which interventions to establish self-echoic responding might produce other collateral benefits. This research was supported in part by a grant from the Texas Christian University Research and Creative Activities Fund and Junior Faculty Summer Research Program. Portions of the data were collected for Jordon D. McCart’s honors thesis at Texas Christian University, under the supervision of Anna Ingeborg Petursdottir. We thank Charlotte L. Carp, Jessica Clothier, Laura Donner, and Maleah Goss for assistance with participant recruitment.